Who are Dave & Emily? 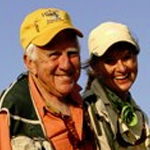 Emily and Dave combined their talents in 1991 and have lectured, instructed and fished together around the U.S. and abroad. A unique fly-fishing team, they are devoted to the world of fly fishing and conservation, both professionally and personally. They live near Tahlequah, Oklahoma, in the lovely Ozark Mountains of northeastern Oklahoma. Dave & Emily Whitlock © 2019. All Rights Reserved.